Objective To determine medical needs, demographic characteristics and healthcare utilisation patterns of the top 1% and top 2%–5% high-cost beneficiaries in the Netherlands. Design Cross-sectional study using 1 year claims data. We broke down high-cost beneficiaries by demographics, the most cost-incurring condition per beneficiary and expensive treatment use. Setting Dutch curative health system, a health system with universal coverage. Participants 4.5 million beneficiaries of one health insurer. Measures Annual total costs through hospital, intensive care unit use, expensive drugs, other pharmaceuticals, mental care and others; demographics; most cost-incurring and secondary conditions; inpatient stay; number of morbidities; costs per ICD10-chapter (International Statistical Classification of Diseases, 10th revision); and expensive treatment use (including dialysis, transplant surgery, expensive drugs, intensive care unit and diagnosis-related groups >€30 000). Results The top 1% and top 2%–5% beneficiaries accounted for 23% and 26% of total expenditures, respectively. Among top 1% beneficiaries, hospital care represented 76% of spending, of which, respectively, 9.0% and 9.1% were spent on expensive drugs and ICU care. We found that 54% of top 1% beneficiaries were aged 65 years or younger and that average costs sharply decreased with higher age within the top 1% group. Expensive treatments contributed to high costs in one-third of top 1% beneficiaries and in less than 10% of top 2%–5% beneficiaries. The average number of conditions was 5.5 and 4.0 for top 1% and top 2%–5% beneficiaries, respectively. 53% of top 1% beneficiaries were treated for circulatory disorders but for only 22% of top 1% beneficiaries this was their most cost-incurring condition. Conclusions Expensive treatments, most cost-incurring condition and age proved to be informative variables for studying this heterogeneous population. Expensive treatments play a substantial role in high-costs beneficiaries. Interventions need to be aimed at beneficiaries of all ages; a sole focus on the elderly would leave many high-cost beneficiaries unaddressed. Tailored interventions are needed to meet the needs of high-cost beneficiaries and to avoid waste of scarce resources. This study presents an in-depth analysis of the medical needs, demographics and healthcare utilisation of high-cost beneficiaries in the Netherlands. We characterised high-cost beneficiaries and spending patterns using several variables, including expensive treatment use (eg, dialysis, expensive drugs and intensive care unit), most cost-incurring condition and age. Analyses were limited to one large insurer, but its beneficiaries are representative for the Netherlands. It is known that healthcare costs are concentrated among small numbers of ‘high-cost’ beneficiaries. These high-cost beneficiaries are the sickest and most complex populations. Although they receive substantial care from multiple sources, critical healthcare needs are often unmet, and many receive unnecessary and ineffective care.1–4 Therefore, high-cost beneficiaries are a useful group on which to focus efforts of quality improvement and cost containment. For effective quality improvement and cost reduction, it is necessary to acquire an in-depth understanding of the characteristics, healthcare use and other factors that drive the costs of these groups of high-cost beneficiaries.5 6 Current literature suggests that a high prevalence of multiple (chronic) conditions may explain high-cost beneficiaries’ excessive care use.7 8 This presence of multimorbidity among high-cost beneficiaries makes them difficult to understand: how to characterise patients that suffer from several diseases? Lehnert et al9 found that the number of chronic comorbidities were nearly exponentially related to costs: the higher the number of chronic comorbidities, the higher the costs of an additional comorbidity. Based on this study, we hypothesised that in high-cost beneficiaries the most cost-incurring condition accounts for a disproportionate share of costs and that secondary conditions account for the remainder of costs. A major limitation of current literature is that little is known about patterns in care use and characteristics among different age groups.10 In addition, until today, no studies have reported the role of expensive treatments (eg, expensive drugs, transplant surgery, intensive care units (ICUs) and dialysis) as drivers of high costs. Further insight in healthcare utilisation patterns is needed to develop interventions and inform policy aimed at high-need, high-cost populations. The primary aim of this study was to determine medical needs, demographic characteristics and healthcare utilisation patterns of high-cost beneficiaries in the Netherlands. We first determined characteristics and spending and quantified the share of high-cost beneficiaries that use expensive treatments. We then used a beneficiary’s most cost-incurring medical condition to examine characteristics and utilisation patterns. In addition, we compared utilisation and conditions across age groups. All analyses were performed for top 1% and top 2%–5% beneficiaries separately. This distinction is often used in literature11–14 and may improve understanding of high-cost beneficiaries. We conducted an cross-sectional study using claims data from 2013 in the Netherlands. In the Netherlands, the Health Insurance Act legally requires health insurers to provide a nationally set benefits package. Nearly universal coverage for curative care is achieved through mandatory purchase of statutory private health insurance.15 16 Analyses were done in-house with Zilveren Kruis, a health insurer covering 4.5 million beneficiaries who were primarily living in the central, eastern and western parts of the Netherlands. The basic principle of the Dutch curative health system is that insurers compete for beneficiaries and that they act as prudent buyers of services for their beneficiaries. Health insurers operate nationwide, are obliged to accept all applicants for basic health plans and are not permitted to risk-rate premiums for these basic plans. Every insured person, aged 18 years or older, is required to pay an annual deductible (€350 in 2013), from which some services, such as general practice visits, are excluded. In addition to the basic health plan, more than 80% of the population buys voluntary insurance. Premiums for voluntary insurance are not regulated, and insurers are allowed to screen applicants. The system provides a wide range of services, including care provided by general practitioners, hospitals and specialists, dental care through age 18 years, prescription drugs, physiotherapy through age 18 years, most mental care, medical aids and devices, maternity care, transportation and others. In our study, we also included private voluntary supplementary insurance that typically covers dental care, some allied healthcare (including physiotherapy, occupational therapy, dietary advice and speech therapy) and complementary medicine (typically homoeopathy, acupuncture, natural medicine, magnetising and osteopathy). Total costs per beneficiary were calculated by summing all claims with a starting date in 2013. We defined the beneficiaries with the top 1% and the top 2%–5% of total costs as two groups of high-cost beneficiaries. The remaining 95% were categorised as low-cost beneficiaries. All claims were categorised in nine cost groups (health sectors) using a link table provided by the Dutch Healthcare Institute. These sectors included: hospital care (including care used abroad), mental healthcare, primary care, maternal care, allied healthcare, outpatient pharmaceutical prescriptions, medical devices, dental care (most dental care is reimbursed through complementary insurance benefits) and voluntary complementary insurance benefits. Below, we describe how we operationalised the variables that we included in our analysis, including the treatment costs per diagnosis, the prevalence of conditions and multimorbidity count and the use of specific (expensive) services. We categorised and analysed hospital and mental care costs, according to the International Statistical Classification of Diseases, 10th revision (ICD-10).18 Treatment costs were categorised to the level of ICD-10 chapters (eg, chapter IX: diseases of the circulatory system) and ICD-10 subchapters (eg, subchapter I60–I69 cerebrovascular diseases). The great majority of hospital care in the Netherlands is reimbursed through payment products similar to diagnosis-related groups (DRGs, which cover both inpatient and outpatient hospital care) and so-called add-ons for expensive drugs and treatment at the ICU. To compute treatment costs per diagnosis, the DRGs were categorised using a link table provided by the Dutch Health Care Authority. This link table (version 22 December 2014) was developed to categorise hospital claims to specific healthcare needs, following the ICD-10 classification.18 For the purpose of our study, we made a few minor corrections to the link table. As we found the ICD subchapter I30–I52 (other circulatory diseases) highly prevalent but not informative, we decided to disaggregate this subchapter. Add-ons were not used for establishing treatment cost per diagnosis but are dealt with separately (see ‘use of specific expensive services’). In 2013, the Dutch mental care sector consisted of ‘primary’ mental care, such as care provided at general practices, by psychologists and psychotherapists, and at ‘secondary’ or specialised mental care provided in mental care institutions. Only claims from secondary mental healthcare were used for characterisation as these specify information about diagnoses and treatment. These claims were categorised to the ICD-10 (sub)chapter and added to the hospital claims for ICD-10 chapter V: mental and behavioural disorders. Additionally, the number of inpatients days in mental care per beneficiary was calculated (but not used for establishing treatment cost). Prevalence of conditions was established using the same categorisation as described above. In addition, we used parameters from the Dutch risk adjustment scheme: pharmaceutical cost groups that indicate chronic use of drugs for different conditions. These pharmaceutical cost groups were categorised to ICD-10 (sub-)chapters and integrated with the former to establish prevalence of conditions. A detailed description of the Dutch risk adjustment scheme is provided in van Veen.19 Multimorbidity was operationalised in three ways. First, multimorbidity was calculated by counting the number of prevalent ICD-10 chapters per beneficiary. Second, we counted the number of prevalent ICD-10 subchapters per beneficiary. Third, the number of pharmaceutical cost groups was counted, reflecting the number of chronic multimorbidities. A separate dummy variable ‘transplant’ was developed, for beneficiaries who received a transplant or transplant-related care (both pretransplant and post-transplant). One DRG description that included the word ‘transplant’ was sufficient for a person to qualify as transplant beneficiary. Similarly, the variable ‘dialysis’ was created for all beneficiaries receiving dialysis for renal failure (both peritoneal and haemodialysis). In addition, all DRGs with an average price >€30 000 were identified and together included as separate binary variable. This price was chosen as all top 1% beneficiaries incurred €30 000 or more. Furthermore, two dummy variables for mental health use were computed, the first on mental care use (>€0 mental care costs) and the second on inpatient stays (>0 days). The total number of inpatient hospital days per beneficiary was estimated using national averages of hospital days per DRG.21 Finally, we used claims data to derive the number of different hospitals, university medical centres and hospital specialisms that beneficiaries were treated at, as well as the number of ambulance transportations, and emergency department visits. For full details concerning the variable computation, please contact the corresponding author. We explored the composition of expenditures across health sectors for both top 1% and top 2%–5% beneficiaries. Demographics, medical characteristics and (expensive) healthcare use were analysed using descriptive statistics. For each high-cost beneficiary, we identified the most cost-incurring ICD-10 (sub)chapter. For both top 1% and top 2%–5% beneficiaries, we first determined the prevalence of each ICD-10 subchapter. Second, for both high-cost groups we summed treatment cost per ICD-10 subchapter and divided this with the sum of total costs. Third, for each ICD-10 subchpater, we calculated how frequently it was the most cost-incurring condition for the beneficiaries in these groups. Fourth, we divided the percentage of beneficiaries with a ICD-10 subchapter as the most cost-incurring condition by the overall prevalence of the ICD-10 subchapter. This metric was used to distinguish between ICD-10 subchapters that were mainly found as most cost-incurring conditions compared with ICD-10 subchapters that were mainly found as secondary conditions. Fifth, for each beneficiary, we divided the treatment cost for the most cost-incurring condition by total costs. This figure was averaged for each ICD-10 subchapter and determines the contribution of these conditions to total costs within the subpopulation. To identify patterns in (expensive) healthcare use, we developed cross-tables with costs per ICD-10 chapter, (expensive) healthcare use indicators and demographic characteristics as descriptive variables. Beneficiaries were selected by the most cost-incurring ICD-10 chapter to prevent that beneficiaries with multimorbidity would be counted several times. Finally, we compared utilisation patterns and conditions across age groups. We examined total costs and spending per sector, and we identified the five most cost-incurring ICD-10 chapters per age group. All analyses were performed using SAS V.9.4, Enterprise Guide 6.1. Average total costs for top 1%, top 2%–5% and bottom 95% beneficiaries were €56 424, €15 780 and €1345, respectively, representing 22.8%, 25.5% and 51.7% of total spending (table 1). For top 1% beneficiaries, hospital care represented 76% of costs, of which, respectively, 9.0% and 9.1% were for expensive drugs and ICU care. 12.7% and 6.6% of costs were for mental healthcare and outpatient pharmaceuticals, respectively. For top 2%–5% beneficiaries, hospital care represented 59.7% of spending, of which 6.0% and 2.1% were spent on expensive drugs and ICU care, while 9.8% and 11.2% were spent on mental healthcare and outpatient pharmaceuticals. Table 1 presents demographic and medical characteristics of the study population as well as (expensive) healthcare use. Males were over-represented among top 1% beneficiaries, and females were over-represented among top 2%–5% beneficiaries. Top 1% and top 2%–5% beneficiaries were much older than low-cost beneficiaries. Furthermore, high-cost beneficiaries were more likely to die: 9.9% and 6.1% of top 1% and top 2%–5% beneficiaries died. However, 63.7% of beneficiaries in our study who died in 2013 or later did not incur high costs in 2013. The average number of morbidities based on ICD-10 subchapters for top 1%, top 2%–5% and bottom 95% beneficiaries was 5.5, 4.0 and 0.8, respectively. Table 1 also shows that top 1% and top 2%–5% beneficiaries scored higher than low-cost users for each specific service, and top 1% beneficiaries scored higher than top 2%–5% beneficiaries. Both top 1% and top 2%–5% beneficiaries used on average one type of drugs (pharmaceutical cost groups) continuously. A percentage of 24.8 of top 1% and 5.8% of top 2%–5% beneficiaries incurred more than €10 000 on expensive drugs and ICU. Furthermore, 6.1% of top 1% beneficiaries underwent dialysis and 3.7% received transplant care. Top 1% and top 2%–5% beneficiaries were treated in on average 1.9 and 1.6 hospitals, and used on average 22 and 7 inpatient days, respectively. Finally, 13% and 3.3% of top 1% and top 2%–5% beneficiaries were admitted to mental care institutions, respectively. Online appendix 1 presents five parameters for both high-cost populations. Among those in the top 1%, a high prevalence of several cardiovascular diseases, chronic obstructive pulmonary disease, diabetes mellitus and depression were found. In addition, the total treatment costs for renal insufficiency (including dialysis) were much higher than for any other ICD-10 subchapter and accounted for 6.8% of total costs among top 1% beneficiaries. We use table 2, with a selection of 10 ICD-10 subchapters in top 1% beneficiaries, to illustrate the other parameters for top 1% beneficiaries. Renal insufficiency, certain cancers and several cardiovascular diseases were frequently found as the most cost-incurring condition among top 1% beneficiaries. Furthermore, for beneficiaries that were treated for cancer, the cancer itself was in most cases the most cost-incurring condition (eg, 74.3% of beneficiaries with leukaemia). In contrast, circulatory disorders were mainly found as secondary condition: for example, in less than 30% of patients with ischaemic heart disease or heart failure, this was their most cost-incurring condition. Finally, we determined the contribution of ICD-10 subchapters towards total costs per beneficiary. The most cost-incurring condition accounted for 40%–70% of total costs per beneficiary, depending on the ICD-10 subchapter. Table 3 and online appendix 2 show cross-tables for spending, demographics and indicators for (expensive) healthcare use. In these analyses, beneficiaries were selected by most cost-incurring ICD-10 chapter to avoid multimorbid beneficiaries being analysed on multiple rows. Among top 1% beneficiaries, three ICD-10 chapters were frequently found as most cost-incurring ICD-10 chapter: mental or behavioural disorders, neoplasms and diseases of the circulatory system. These groups had quite different characteristics and utilisation. Beneficiaries with mental or behavioural disorders were relatively young, had a low number of morbidities and low mortality. Beneficiaries with neoplasms were the largest subgroup with high mortality. Beneficiaries with diseases of circulatory system were oldest (on average 69 years old) and predominantly men. Expensive drugs were heavily concentrated among beneficiaries with neoplasms. ICU costs were distributed more proportionally; a quarter was incurred by beneficiaries with circulatory diseases. Among top 2%–5% beneficiaries, the same three most cost-incurring ICD-10 chapters predominated, although they represented a smaller share of the group. Several other ICD-10 chapters had relatively high costs, including diseases of the digestive system; injury, poisoning and certain other consequences of external causes (femur fracture most prominently); and diseases of the musculoskeletal system and connective tissue. Beneficiaries with neoplasms, diseases of the respiratory system and symptoms, signs and abnormal clinical and laboratory findings most frequently died. Expensive drugs were primarily used by beneficiaries with diseases of the musculoskeletal system (rheumatoid arthritis), neoplasms and diseases of the digestive system. This Figure 1 and online appendix 3 provide an overview of cost segments per age category among top 1% and top 2%–5% beneficiaries. With the exception of infants, treatment at the ICU represented a maximum of 10% of costs per age group. Moreover, treatment at the ICU represented a major cost driver primarily among top 1% beneficiaries. The proportion of costs spent on expensive drugs was highest (13.4% of total costs) among top 1% beneficiaries between 21 and 30 years old. Mental care accounted for a large share of costs among children and young and middle-aged adults. The percentage of cost incurred by outpatient and non-expensive pharmaceuticals was more pronounced among top 2%–5% beneficiaries than among top 1% beneficiaries. Cost drivers per age group in top 1% beneficiaries. Table 4 and online appendix 4 present the five ICD-10 chapters with highest total costs per age group for top 1% and top 2%–5% beneficiaries. As mentioned before, we found that high-cost beneficiaries are generally older than low-cost beneficiaries. However, table 4 shows that within the top 1% beneficiaries average costs decreased with higher age: average costs ranged from €47 000 on average for top 1% beneficiaries over 80 years of age to >€80 000 on average for infants. In addition, 54% of top 1% and 57% of top 2%–5% beneficiaries were 65 years of age or younger. For each age group, there were different ICD-10 chapters with highest costs. Among top 1% beneficiaries, cardiovascular diseases and diseases of the genitourinary system gained importance with higher age, whereas mental and behavioural disorders predominated among younger and middle-aged beneficiaries. Among top 2%–5% beneficiaries, a similar pattern of diseases across age groups was observed. However, pregnancy-related conditions played a more significant role among beneficiaries between 20 and 40 years of age, and musculoskeletal conditions played a more significant role in several age groups than they did among top 1% beneficiaries. In this study, we determined medical needs, demographics and utilisation patterns of high-cost beneficiaries in the Netherlands. Expensive treatments, most cost-incurring condition and age proved to be informative variables for studying this heterogeneous population. We found that expensive care use (expensive drugs, ICU treatment, dialysis, transplant care and DRG >€30 000) contributed to high costs in one third of top 1% beneficiaries and in less than 10% of top 2%–5% beneficiaries. High-cost beneficiaries were overwhelmingly treated for diseases of circulatory system, neoplasms and mental disorders. However, neoplasms and mental disorders were mainly found as most cost-incurring condition for a beneficiary, whereas circulatory disorders were mainly found as secondary condition. More than 50% of high-cost beneficiaries were 65 years of age or younger, and average costs decreased sharply with higher age within the top 1% population. Such insights are needed to develop tailored interventions and inform policy aimed at the high-need, high-cost populations. This was the first study assessing utilisation patterns of high-cost beneficiaries in a European universal health system, and we used innovative variables to examine characteristics and utilisation. We used data from one health insurer with a market share of approximately 27%, with data representative for the Dutch population. Despite the limited number of variables, our data allowed detailed identification of healthcare use and categorisation of costs towards conditions. We chose to use expensive treatments, most cost-incurring condition and age as variables for further analyses as such analyses were lacking in the literature, and we regarded these as most informative for policy and practice. One limitation is that our analysis was restricted to 1 year only. Consequently, we could not discern persistent high-cost users from episodic high-cost users (those with single a high-cost event5). Our study is unique in estimating the relative contribution of expensive treatments in high-cost beneficiaries. The findings indicate that high unit costs for selected services play a substantial role in high-costs beneficiaries. 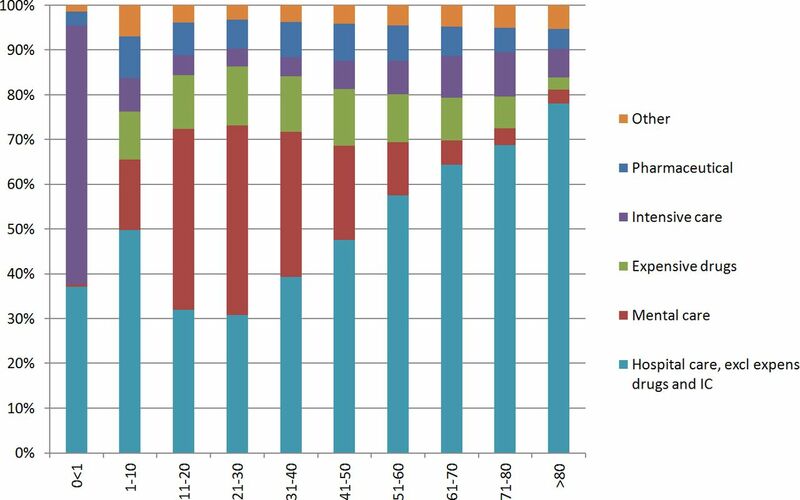 We identified expensive treatment users among expensive patients. Furthermore, our analyses show expensive treatment users may use a lot of care besides such expensive treatments, suggesting that better alignment of expensive treatments with other care may be worthwhile. In line with Joynt et al22, we suggest that expensive procedures (including orthopaedic surgery, pacemaker implantation and so on) and catastrophic events may be a more significant cost driver in high-cost beneficiaries than avoidable hospitalisations and that a complementary approach (see below) in high-need high-cost programmes is needed. To our knowledge, we are the first that have distinguished the most cost-incurring versus secondary conditions in high-cost beneficiaries. For example, diseases of circulatory system were mainly found as a secondary condition, though they also frequently occurred as most cost-incurring condition. In addition, mental disorders and neoplasms were predominantly the most cost-incurring condition. Our findings contribute to the rapidly evolving field of multimorbidity and patterns of healthcare use. We suggest that conditions that were frequently and primarily found as most cost-incurring condition should be priorities for policies that seek to contain costs and improve quality of care. However, the observational nature of our study does not allow for causal inference; that is, the high number of morbidities in patients with cancer may either indicate the many complications from cancer treatment or point to prior chronic disease in patients with cancer. Many high-cost beneficiaries were 65 years of age or younger; and the average costs decreased sharply with increasing age within the top 1% beneficiaries. In addition, we found typical care needs and utilisation per age group. Both findings have rarely been reported in literature10 and underline the need for studies in the general population with comprehensive data. Furthermore, high-need, high-cost programmes need to be aimed at beneficiaries of all ages; a mere focus on elderly would leave many high-cost beneficiaries unaddressed. In conclusion, our findings show that high-cost beneficiaries are usually treated for several conditions and use care from multiple providers. Expensive treatments, the most cost-incurring condition and age proved to be informative variables for studying this heterogeneous population. Tailored interventions are needed to meet the needs of high-cost beneficiaries and to avoid waste of scarce resources. The authors would like to thank Gerrit Hamstra for initial work in the study.
. High-Need, High-Cost Patients: Who are they and how do they use health care? A population-based comparison of demographics, health care use, and expenditures. Issue Brief 2016;26:1–14.
. Persistent high utilization in a privately insured population. Am J Manag Care 2015;21:309–16.
. The Netherlands: health system review. 18, 2016.
. Fund C, ed. International Profiles of Health Care Systems, 2015.
WHO. International Statistical Classification of Diseases and Related Health Problems 10th Revision. 2016;23 http://apps.who.int/classifications/icd10/browse/2016/en.
. Evaluating and Improving the Predictive Performance of Risk Equalization Models in Health Insurance Markets. Erasmus University Rotterdam: Rotterdam, 2016. NZa. Investigation of the accessibility and affordability of medicines in specialist medical care. Dutch: Dutch Healthcare Authority, 2015. NZa. Open DIS data, 2016. www.opendisdata.nl.
. Developing care for a changing population: supporting patients with costly, complex needs. 2016 Nuffield Trust. Contributors JJGW drafted the first manuscript and conducted the data analyses. JJGW, PVdW and MT conceptualised the study and interpreted the data. WJ provided assistance in data preparation, statistical analyses and was involved in interpretation of the findings. GPW and PPTJ made a substantial contribution to the development of the research question and interpretation and presentation of the findings. All authors provided feedback to and approved the final manuscript. Funding The study was conducted as part of a research programme funded through the Dutch Ministry of Health. The funding source had no role in study design; in the collection, analysis and interpretation of data; in the writing of the report; or in the decision to submit the manuscript for publication.